In a battle for the title, Honda's Marc Marquez took his seventh world championship at the Japanese GP as Andrea Dovizioso crashed out. Repsol Honda's Marc Marquez has been crowned as the 2018 MotoGP World Champion after a nail biting finish in the Japanese Grand Prix. The Honda rider won the fourth last race of the season fighting against Ducati's Andrea Dovizioso. The last laps though is where Marquez managed to lead the race as Dovizioso crashed while in second place. 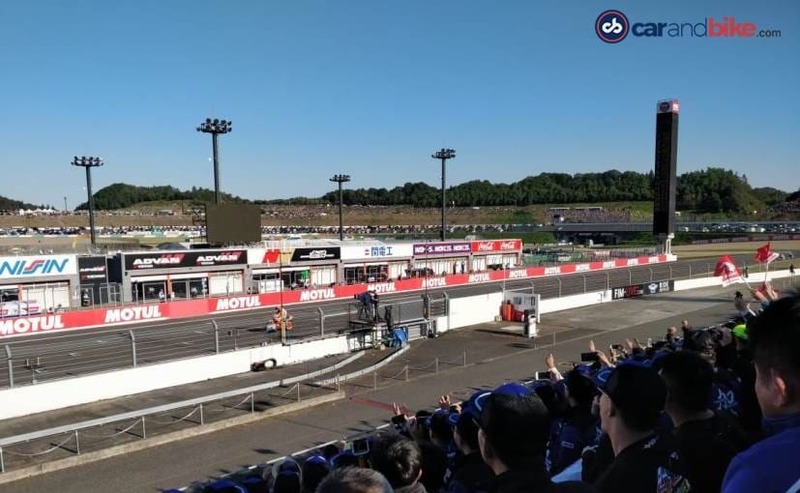 With the Japanese GP under his belt, the Honda rider takes his seventh world championship title at the manufacturer's home turf, and his fifth world title in the premier class series. Marquez now equals Mike Doohan's world titles but is still behind Valentino Rossi's seven and Giacomo Agostini's eight titles. The 24 lap race started with Dovizioso on pole while Marquez started only sixth at the Twin Ring Motegi circuit. A brilliant start allowed Marquez to move up to second on the opening lap as he closes in on the race leader. Behind him were Danilo Petrucci and Jack Miller at P3 and P4 respectively, while Yamaha's Valentino Rossi jumped to sixth having started at ninth on the grid. Marquez was quick on his tail for most of the race having briefly take the top spot around the midway point. However, Dovizioso was quick to take back the top spot with Marquez continuing to maintain a close second. The Honda rider though finally found a gap and passed Dovi on Lap 21 at Turn 9, but the Ducati matched the Honda's pace and a pass from Dovi seemed possible before the chequered flag. However, the Ducati rider lost his front at Turn 10 on the penultimate lap and slid into the gravel. It was no looking back for Marquez who throttled his way to victory. Coming in second was satellite rider Cal Crutchlow of LCR Honda with a gap of 1.5s of Marquez, and moved up to P2 after Dovi's crash while Suzuki's Alex Rins finished on the podium. Crutchlow had the pace through the race and was quick enough to battle with the race leaders. Meanwhile, Runs and Iannone showed impressive pace as well but crashed out early in the race. Dovi and Iannone's crash promoted Rossi to fourth, down by five seconds over the race leader, while Alvaro Bautista on the Nieto Ducati took a career best fifth, having started 11th on the grid. Tech3 Yamaha's Johann Zarco finished sixth after a bad start, but recovered to the position after dropping to outside the top 10 in the race. Finishing at P7 was Dani Pedrosa of Honda, followed by Pramac Ducati's Danilo Petrucci and Tech3's Hafizh Syahrin. Bradley Smith was the faster of the two KTMs and finished 12th behind Franco Morbidelli of Marc VDS Honda. Coming in 13th was Pol Espargaro on the second KTM followed by Katsuyuki Nakasuga and Takaaki Nakagami. Having remounted from the crash, Dovizioso finished 18th scoring no points at all, after a brilliant run. With Marquez crowned as the champion, it now needs to be seen who will be the runner up for the 2018 MotoGP season. The race is on between Dovi and Rossi with the latter behind by just 9 points over the Ducati rider. The season still has three races left at Sepang, Philip Island and Valencia.